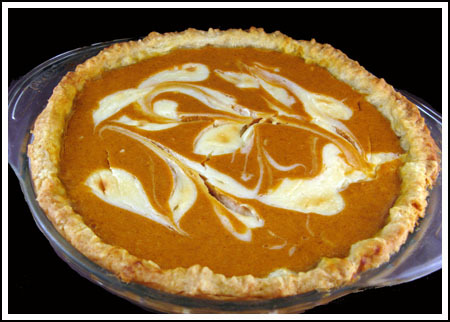 If you like the idea of pumpkin pie at Thanksgiving but would rather eat cheesecake, Marbled Cream Cheese Pumpkin Pie is the perfect holiday pie. I found the original recipe last night and had everything on hand except the pecan cookies which were supposed to go in the crust. Not wanting to go to the store for cookies, I used a traditional homemade pastry crust and made some adjustments to the filling. The pie was excellent! I just made it and can’t wait to make it again with the right crust. When I do, I’ll take a better photo. My only complaint about the pie is that the top cracked a little, but other than that it is perfect. A pumpkin pie with a ribbon of cream cheese marbled through it. Beat cream cheese and sugar with electric mixer until smooth; Beat in the vanilla, then add flour and stir or beat on low speed until mixed. Set aside ½ cup of the cream cheese mixture, then add all remaining filling ingredients except milk. Beat on medium speed, scraping bowl often, until smooth. Pour into crust. Cover edges of foil loosely with a strip of foil to prevent the crust from over-browning and bake on center rack for 35 to 40 minutes or until knife inserted in center comes out clean, removing foil for last 15 minutes of baking. Cool to room temperature. Cover loosely and refrigerate at least 4 hours before serving. Store in refrigerator. i made this last year twice for my family! it turned out beautifully both times. although it didnt fit in one of my disposable pans so i ended up making cupcake sized versions of it, which my family loved! making it again for thanksgiving dessert. this is my favorite pie recipe! After chilling the pie overnight, it sank considerably and firmed up. It was fabulous! On reflection, I think I probably beat the mixture at too high a speed after adding the eggs which made the mixture too poofy. Next time, I’ll tone it down a bit. Everyone loved this pie, and I’ll be making it again for sure. Thanks again for the recipe! Sorry to hear your pie didn’t work out. My family liked this on so much that I made another one yesterday. This time I used the recipe straight off Betty Crocker, complete with the pecan sandie crust. I used a Pyrex deep dish pie pan. The filling wasn’t fluffy at all and it all fit into the pan. This one didn’t even crack. Could you have overbeaten the eggs, perhaps? Did you not take about enough cream cheese? That is so strange. I am really sorry yours didn’t work out and wish I could be there to help you troubleshoot. Oh well. If it tastes good, it’s a win! I hope you and your family have a super holiday! Thanks for all your great recipes and tips throughout the year. Ok, I made this pie tonight for Turkey Day tomorrow. I haven’t eaten it yet, of course, but it looks great (hairline cracks only). I opted for a ginger snap and walnut crust (no flour, more butter, pinch of salt). I also had quite a bit of pumpkin filling leftover, so I made a little mini-pie on the side for my next-door neighbor. I look forward to tucking in to the big pie tomorrow! Thanks for the recipe. HAPPY THANKSGIVING, Anna! P.S. If using two 8 oz. packages of cream cheese, I recommend throwing the leftover amount into the mashed potatoes that I’m sure you’re making for the Feast of Thanks. It will make them positively SINFUL! I’m obsessing over what to make for Thanksgiving desserts. I like the way this pie looks, and like that this isn’t really pumpkin pie, but pumpkin pie/cheesecake. I’ve looked at a pumpkin cheese cake on epicurious that has 4 four forks and 312 reviews, but the more I’ve read the more I thought it doesn’t really sound like what I want. There is a recipe in Baking Illustrated but I’ve found some places on line that have reviewed that and they’re a bit mixed too, which brings me back to this recipe. When I mentioned the idea of pumpkin cheesecake to my daughter she was really excited about that idea, but I can’t make up my mind! HELP!! Was this more like pie, or more like cheesecake? What was the texture like? I’m going to make this for our Thanksgiving dinner. Thank you, Linda, for your comments – I’m definitely going to make it ahead of time. I love using a springform pan for crumb crust “pies”, I cannot for the life of me get that first piece of a crumb crust pie out of a pie pan without it looking terrible! I made this over the weekend. Full disclosure – I got distracted and added everything except the pumpkin and milk before I took the 1/2 cup cream cheese mixture out. I, too, didn’t have pecan sandies, so I used graham crakers and a handful of ground pecans for the crust to make the 1 1/2 cups. 3 Tablespoons of melted butter wasn’t enough as the crust wouldn’t stick together. I also wonder why it called for 3 T. of flour in the crust, but I went ahead and added it – I don’t think I would bother with it again. I baked this in a 9 inch springform pan. I was short on time and cooled it in an ice bath, then served it after only about 3 hours in the refrigerator. I wasn’t that crazy about it, but my husband liked it. After another 24 hours in the refrigerator, we both thought it was *much* better. It was very attractive, and would be a nice “company” dessert. Next time, I would add a pinch of salt, and up the amount of spices, especially ginger; and make it a day ahead of time to allow the flavors to sort of meld. Just what I’m looking for to take for Thanksgiving! I love the idea of the pecan sandie crust. Just beautiful. To avoid the cracking, try putting the baking dish in a pan of hot water about half-way up the sides of the baking dish. This provides a gentler bake which should not crack. How can you hate popcorn?! It’s America’s favorite snack! Just kidding. I noticed it always makes our house smell badly. I HAVE TO WIN THE Psilakis book. I have a huge crush on him. He is HAWT. I’m making a cranberry chocolate cake, pecan pie, pumpkin pie, and maybe something else. I’m trying not to over-do it. I have a feeling that because of the cream cheese, it would make the structure similar to cheesecake. Maybe baking with a waterbath would help with cracking? My goodness, I want to make this, it looks like so much fun! I’d make this just so I could play with swirling the cheesecake and pumpkin together. I love to play with food! haha! Love your ideas about the minis and the gingersnap crust. Katrina, I think the 11 oz comes from the fact cream cheese is sold in 8 oz and 3 oz packages. The person who invented the recipe was trying to make it so there’d by no cream cheese leftover. Payal, I’ll have to try fruitcake one of these days. It’s not something I know how to make but it would be fun to learn. Also, Joy of Baking’s looks good. KAnna, this pie would be good with a gingersnap crust. In fact, I’m thinking of making it as minis (cupcake size) and putting whole gingersnaps in the bottom for the crust. Anna, I make a gingersnap cookie crust for my pumpkin cheesecakes and the pumpkin ice cream pie I make for the holidays-I use WF 365 packaged gingersnaps but I used Nabisco for years. Hi Anna, would really appreciate if you could review some christmas fruit cake and post recipes..am looking for the perfect fruitcake recipe..have you ever tried the one on joyofbaking site? I think it looks perfect even though it does have a crack in it!! I don’t know how I’m going to make everything I want to make for Thanksgiving! I’d love to take this to our cousin’s house this year! I always thought the crack in the pie meant it was done all the way though! I make my mother’s recipe, which is more of a pumpkin custard pie. See now why didn’t anyone else ever think of that? Oh, I guess since you found the recipe, someone DID think of it. But what a great idea. Love the swirl. cheese…oh man that sounds good!!! I make something really similar, but the other way around-more cheesecake less pumpkin, and it’s the favorite Thanksgiving dessert around here. Your version looks delish. I’ll definitely try it out!